While we know that the functions of Sales and Marketing make up our growth engine, the question on the table is how do we get these functions to operate in a successful way for building our businesses at market pace or better? 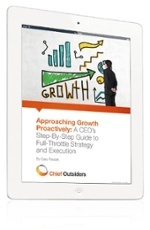 This webinar, hosted by Mary Doizé, Partner & CMO at Chief Outsiders, delves deeply into the tactics and strategies in both functions that can turn your growth engine into a high functioning machine. You will walk away with specific actions to turn up the dial on your business growth. Come join for a dynamic review of how to grow at a faster pace!